John Lennon’s Art Is A Fraud? Does This Man Knowingly Sell Fraudulent Artwork? I was so excited to take Mrs. LanceAround to see the artwork of John Lennon for Valentine’s day. She really admires John Lennon. I knew it would also make a great post for my readers. Before going, I did some research on the show. 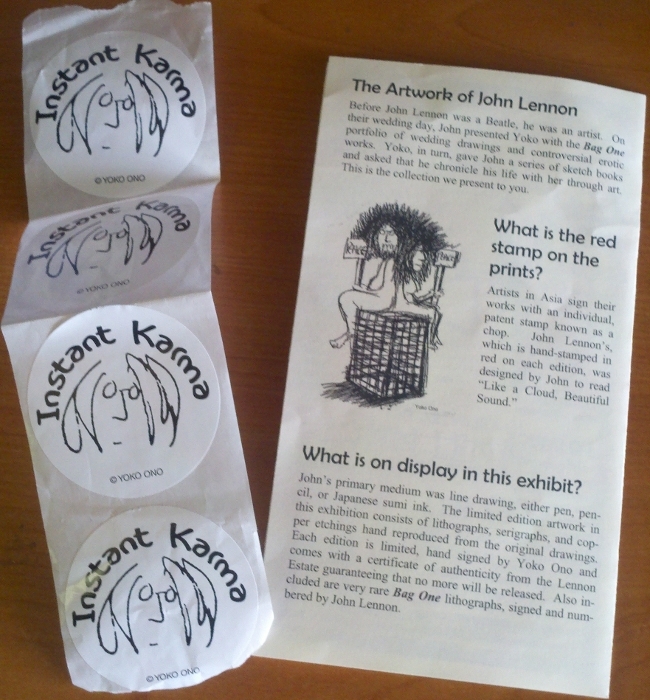 That’s when I encountered this blog post by Gary Arseneau, who claims the entire John Lennon art show is a fraud! In his blog, Gary has created an extensive, well documented text where he makes this claim. John Lennon was a pen and ink artist, yet the artwork in this show has color added. In some cases, the entire composition of a piece has been altered from the original drawings done by John. Signatures and chop marks are also postmortem additions, as is the creation of limited edition numbered prints. According to Gary, these alterations, done after John’s death, mean that the artwork is a fraud. I was devastated. Mrs. LanceAround is so ethical, it would crush her to learn that a display of Lennon’s work was a forgery. I decided to gather more information before telling Mrs. LanceAround what I discovered. As we pulled up to the art show, I instantly recognized Rudy Siegel from the photos of him on Gary’s blog. I sat by the entrance and watched him greet everyone as they entered the show. He took a donation and gave them an “Instant Karma” sticker. At one point, I asked him pointedly if the artwork was all original John Lennon. He told me right away that John was a pen and ink artist and it was Yoko Ono who added the color to the pieces. He also spoke about the process of turning them into lithographs and adding signatures and chop marks. I walked through the exhibit and observed the other employees from Legacy Fine Arts & Productions–the company Yoko hired to produce the show. They would hover around the crowded room and engage anyone who appeared interested in the art. It was obvious that they were trying to make a sale. I felt as though I were in a used car lot. Were the smiles phony or was I being unduly influenced by Gary’s blog? I asked Rudy if I could interview him privately. He was busy at the front door, so I had to find one of his coworkers who could take his place while I spoke with him. I asked him directly about Gary’s accusation. When I mentioned Gary’s name, I noticed that the smile did not fade from his face, but I could sense some tension as he responded. He said that Gary was someone who obviously had a grudge. When I asked if he felt that the artwork was fraudulent he responded by pointing out that he wouldn’t be doing an art show every week of the year if he thought the artwork was a fraud. I couldn’t help but notice that he did not directly state that the artwork was not fraudulent. On the way home, I showed Mrs. LanceAround Gary’s article and told her about my interview with Rudy. As I suspected, it introduced some negative vibes into what was a very positive day. So, is this artwork fraudulent? –It is clear that the vast majority of artwork displayed in the show had many alterations from the original pen and ink drawings by John Lennon. –These alterations were done at the behest of Yoko, who holds the legal copyright for John’s work. –Could they have been more up front about how these pieces of art were created and altered–absolutely! 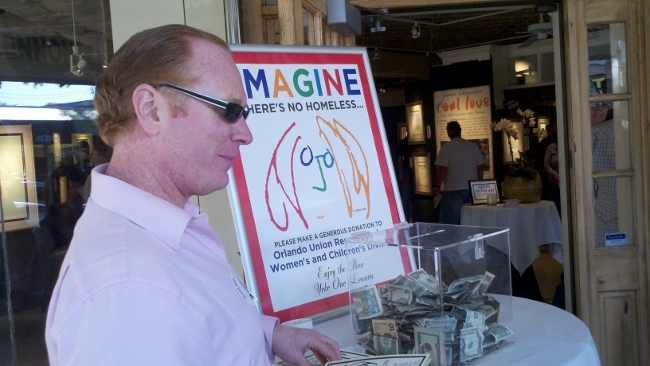 –The art show was a very smooth presentation where attendees were invited to enjoy “instant karma” and make a donation to charity. However, for me personally, all of this felt like a slick advertising ploy to use the legacy of John Lennon to make a sale. –Does Yoko have the right to change John’s artwork, produce slick shows and use this venue as a way of making money? That’s debatable, but as John’s heir, I believe she does. –Did John choose Yoko to be his wife and, upon his death, inherit the proceeds of his legacy and the right to do with this legacy as she sees fit? I don’t believe there is any doubt about this. –Are there some people who wish John Lennon had chosen a spouse who would have made different choices regarding his artistic legacy? Perhaps that’s the real question. I’m wondering if that is where Gary is coming from in his post. I know it is a question that has been a topic of conversation for a lot of people over a very a long period of time. The only thing I will say in conclusion is, based on my research and reading the comments from people who have purchased “art” at this show, I wouldn’t buy a piece from Legacy Fine Art and Productions anytime soon. The main reason for this is the testimonies on Gary’s blog indicate this artwork actually loses significant value after it is purchased–which says to me that there are too many people in the art world who do not believe it is worth what the production company is asking for it. On the other hand, I did find going to the show to a very positive family experience. It was inspiring to listen to John’s music and see the artwork that was, at the very least and undeniably, inspired by John. Prices Range From $200 to $20,000--But is it Art? This entry was posted on February 25, 2011 at 10:15 am and is filed under Art Community. You can follow any responses to this entry through the RSS 2.0 feed. You can leave a response, or trackback from your own site. 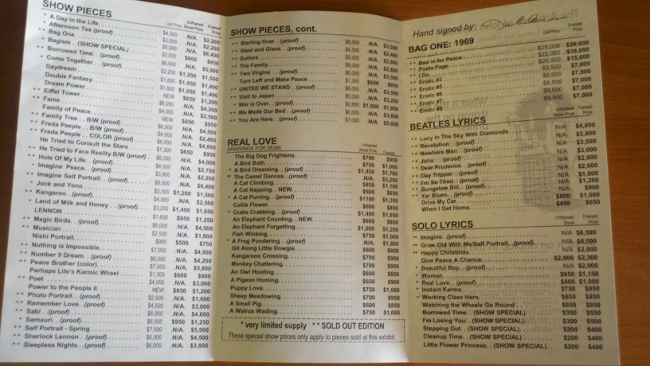 Is there a class action law suit against Legacy and/or Yoko Ono for fraud?